What's that you say? Telerik doesn't have RadControls for MOSS anymore? Well, technically you are correct. We do not have a separate product line just for MOSS 2007 like we used to for MOSS 2003, but that does not mean we do not have controls for MOSS 2007. Quite the opposite. 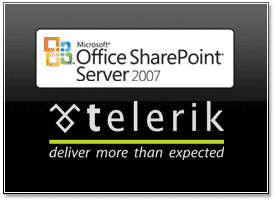 We have one of the most robust and feature rich set of controls for SharePoint 2007 since all of the RadControls for ASP.NET work flawlessly in SharePoint. In addition to these resources, I am also working on building out a live MOSS 2007 web site that features all of the RadControls running in SharePoint. So far we've got a simple demo online that shows RadMenu and RadRotator running in MOSS, but in the next couple of weeks we'll add demos for the rest of the RadControls (and improve the overall look and feel of the demo site, obviously). We hope you enjoy these new resources and find them helpful if you're working on a SharePoint 2007 project.